Ok, 2B's, 15 C's, and 5 D's so far. C here too. This makes me wonder whether the "value" of the OS will hold as our collections get complete (is that even possible?). I've been watching sale prices go up and up and up since I got back into gpk almost 10 years ago but I gotta imagine that at some point it'll stop, especially if it's primarliy "our" generation that's paying attention to them. What do you guys think will happen to the prices as demand dries up? There have been many of these types of discussions. My own prognostication is that unless there's a horrific disaster that destroys the economy, then the value will slow down and creep up at a more realistic pace, but not dive. I say that based on other older card sets, such as Wacky Packages, Mars Attacks, Ugly Stickers, etc. On those sets, the cards and the original art has continued to rise, some of it quite substantially. The original artwork for those earlier sets is practically impossible to even find for sale so you can image the value when it does sell. GPK was bigger than all of those earlier sets. Even Len Brown (an executive at Topps who was there for 40 years, including all of its biggest hits) said that GPK was likely the biggest ever. 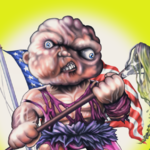 So, to me, that means GPK value isn't going to go down anytime soon. Once we're gone, the historian art collector types will be still clamoring for this stuff because of its pop culture historical value. For example, look at the early cartoons and comics and see how much those cost now...insane prices, some millions of bucks. But this is just my guess, who really knows right. It's all about desirability when it comes to value retention. True, very true. Thank you brother Steve for the shout out to my very exclusive autograph service. I generally don't promote it since its exclusive for only the hugest movers and shakers in the hobby, but lucky for you commoners I have some openings. For only 75$ I will provide my exclusive autograph in the front of the card. Already and amazing deal right? But on the back I provide comments and commentary about the card specifically or what happens to be on my mind. I know what you're thinking........I have so many cards I want to have a tommy4ya autograph on but some are graded. Not to fear! For only 25$ more I will expertly remove the card from the graded case and seamlessly put it back. Case looks completely unaltered, even professionals are fooled. Here is my latest project for what I'm sure will be a very satisfied client, marvel at the seamless craftsmanship and exemplary artisan attention to detail. These are mine. Everyone else just back off. PM sent tommy. Bidding War!! This is soooo much more interesting than that Adam Bomb card. It's so flawless I can barely tell, but is there tape on it. Wow, it's so invisible I can barely see it. What did you use some kind of magic tape or something? Incredible! Damn son do you have an 8k monitor or something? Lets not give out house secrets ok? Not that I'm worried about the competition, really who else can pull off a masterpiece. I don't want other people trying and obviously failing but blaming me. While we're on the subject can I get someone banned? They keep offering me crazy low ball trades for my majestically crafted autos. The offers are so low its down right disrespectful. Pegleg Peter final art for my sweet graded autos? Um that final art isn't even graded, and its not autographed by me so..........how about no and stop asking. I won't name names for fear this place will turn into a mob against him and the benevolent soul that I am I don't want that to happen to FoulRaoul. How about if he throws in Mad Donna? That's his final offer, take it or leave it salami. I thought about this long and hard. Deep down Raoul is a good guy and could use a bump up in his collection. Ok I accept this deal. Its supreme sacrifice and charity on my end so please never forget my humility and generosity. I'll ship out tomorrow so please ship the finals right away. You know it really feels amazing to perform a good deed. Sometimes you gotta give a fellow collector a good deal. Rahul sincerely appreciates your generosity, and the finals will be shipped out tomorrow. Time to close this chapter, and let everyone enjoy their new found treasures. wow, cant get over all the love on this board!! haha thank you both steve and tommy for making this deal of a lifetime FOR me! i literally didnt know that i was trading two 'meh' finals for those exquisite psa slab remnants!! despite tommy being incorrect about the final art being graded and autographed by him, the deal was too good to pass up. i have mailed out the graded/autographed pegleg peter and mad donna out to their new owner! .......and i am clearing some space here, with a little spotlight for that tattoo lou slab. steve knows the art of the deal...your psa graded and tommy4ya autographed split kit final is in the mail. Thanks Rahul! Looking forward to getting Split Kit! Tommy is such a sucker, we worked him like a $2 ho on 4th street. When he gets those worthless finals he's gonna realize we hooked his tighty whiteys over his head and buyers remorse will set in so beware Rahul. That’s the greatest thing ever!!!! I was born a couple years before you. My guess is that most collectors are our age. But then again I don't hang around Target watching to see who is pulling packs out of the gravity feeds, so who knows? Maybe there's a whole bunch of hot 30 year old chicks buying up the new series. Maybe I *should* go to Target. I wonder if there’s a decent amount of 8-12 year olds buying backs? I hope so. If there were 8-12 year olds buying packs at one point, I'm sure they've been scared off by the last few themed series, which I have to believe appeal only to adults. We Hate the 80s? Children wouldn't relate to it, it was designed specifically for middle aged people. BOTB? Kids might know some of the bands, but a lot of them are from the 70s to 90s. Even Adam-Geddon deals with subject matter that kids might not understand, like its nuclear war related cards, political cards, and other heady stuff. I think Topps has successfully scared off the latest generation of collectors. Topps has a chance to bring in a new generation of collectors with their horror set that's due for release. But they have to do it right. It can't be all nostalgic references to 1980s horror that we would appreciate but kids won't. If, instead of giving us Cenobites and the Shining twins, they give us universally loved monsters like werewolves and zombies, I think they will appeal to kids. But that's a big if. But maybe Topps knows what it's doing by making cards for 40-year-old men. I'm not a business executive. I'm sure they know how to make money better than I do. And maybe they've run the numbers and realized that physical card collecting is a dying hobby. Maybe they can only make money by selling to adults like us, rather than to kids. That's bad news though, because if you can't grow your customer pool you won't last very long. And there was already a Bloomberg report this year suggesting Topps is trying to sell the company. The jig might be up very soon for Topps. Sorry to disrupt the flow, but you got an E right here! I'm a 90's baby boy. I had always kind of known about GPK and Wacky Packages but I first really got into GPK when I was on a family trip in Arkansas and spotted some All New Series 2 packs at a comic shop. I bugged my parents to take my brothers and I again before we left so I could get a couple more packs and I still got em'. Although the concepts aren't as strong or gross, I still love seeing them around. I'm pretty excited for the new Horror theme set though. That's like my two favorite things. Also, hey guys! I'm new here. Hey thanks! I'll be here to fill you guys in on what us dumb millennials are up to! Welcome aboard! You missed a great decade.